"The banking system in the Eurzone periphery is under water, with a non-performing loan pile of $1.5 trillion to $2 trillion euros. Eastern Europe could become the epicenter of funding risk in 2014 due to big refinancings." Europe has been a fascinating situation to watch over the last 18 months. In the late summer of 2012, the head of the European Central Bank (ECB) gave his now famous "We Will Do Whatever It Takes" speech. His objective was to imply to the market that the ECB stood ready to print an unlimited amount of euros to calm any sovereign bond market that began to lose control. 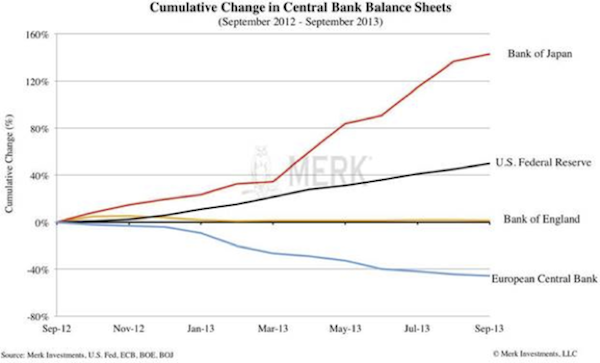 Up until that moment, the market was unsure where exactly the central bank stood. They continuously tested the ECB by loading up on credit default swaps and shorting the toxic debt of Portugal, Ireland, Italy, Greece and Spain. Hedge funds had the ability to drive markets into chaos and make a tidy profit doing so. When the markets heard "whatever it takes," all previous bets were off. The interesting part is that we do not know if the ECB was actually willing to carry through on this promise. They brought a bazooka to the negotiating table and no one questioned whether it was loaded. Investors around the world immediately began piling into toxic high yielding sovereign bonds, believing that the ECB now stood behind them, just as the central banks have them covered in the U.S., Japan and the U.K. Yields have fallen steadily from that moment in late 2013 through today. As we will discuss, many of the most toxic sovereign bonds are now at a spread less than 100 basis points from the U.S. risk free rate. The first part of the ECB's Illusion was built on a bluff. The trick itself never even had to be performed. You can see in the chart below that while the balance sheets of the Bank of Japan and the Federal Reserve have been growing at an incredible pace, the ECB balance actually decreased in size over the last year. The ECB cut rates in November, but this move is pittance compared to the QE engines firing in the U.S. and Japan. 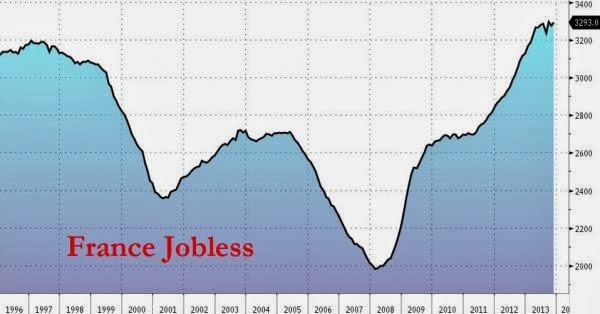 Bernanke and Kuroda laugh at rate cuts, which are "so" 2007. Due in large part to the ECB's balance sheet reduction, the core inflation rate has stayed low. A lower inflation (or even deflationary) environment makes it far more difficult for governments to service their debts. While the rest of the developed world has implemented financial repression successfully, Europe has yet to put the process in motion. For an understanding of this important concept see: What Is Financial Repression. Many market participants see sovereign rates falling and believe the Eurozone's trouble are now in the past. Unfortunately, nothing has been structurally fixed within the Eurozone. The debts are building under the surface, creating a larger crisis in the years ahead. How have the debts been hidden? That brings us to the second part of Europe's Illusion, the sleight of hand. The sleight of hand trick is simple - the governments continue to issue more debt than they can afford and the banks within that country purchase the bulk of the issuance. It may seem silly for the banks to participate in such a scheme, but when you walk through the entire thought process it actually makes sense. Most of the banks within these bankrupt countries already hold a tremendous amount of toxic debt on their balance sheet. The only thing keeping a run from occurring is the implicit government guarantee in place should the banks run into trouble. With this understanding in mind, you can see the banks have no choice. 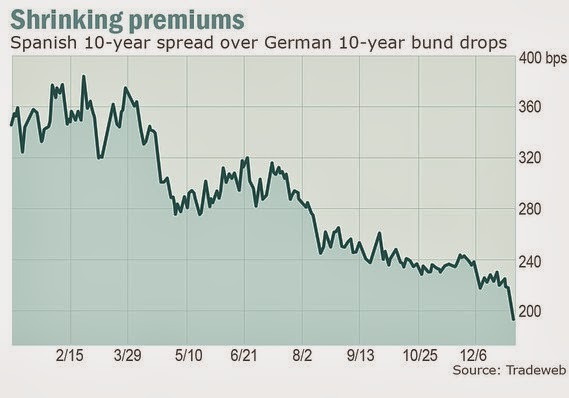 They are purchasing high yielding government bonds (and over the last year they have made great profits on these purchases) with the hope that the governments will stay solvent or the debt will be purchased by the ECB when the time comes. The name of the game in today's global debt ponzi scheme is to do everything you can to push the day of reckoning back one more day, or one more hour. In the meantime, you can pretend that everything is okay on the surface. This is how the Illusion is performed and Europe has finally learned its secret. As we will show in a moment, this process has helped lower interest rates on government bonds which has temporarily eased the funding needs of the governments. Unfortunately, while credit is being diverted toward the government sector, the private sector (which generates real growth and tax income) has been ignored. Lending to businesses in Europe requires a large reserve requirement. The ECB has provided money to lend to businesses, but the capital has been used to purchase government debt because the reserve (capital) requirements to make a government loan is almost non-existent. This allows the banks to leverage up at the highest possible rates of return. Under the surface, the Eurozone grows more fundamentally flawed by the day. Germany began to make structural changes, such as re-working their labor policies, before the crisis hit. The remainder of Europe did not take these actions, and they have been blindsided by a freight train. Germany has seen their exports rise and unemployment fall. The rest of Europe has experienced the opposite. Yet all is not roses, even in the beloved Germany. Their largest bank, Deutsche, now has the largest derivatives portfolio in the world at $70 trillion. The are the most highly leverage bank in Europe at 60 to 1 (Lehman reached a peak of about 40 to 1). If something goes just slightly wrong with their portfolio, they will be far too big to save. 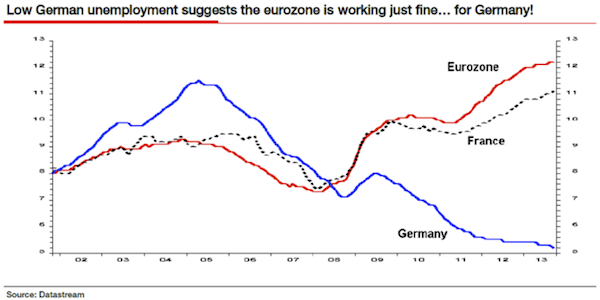 At some point the divergence between Germany and "the rest" will come to a head and the system will snap. Either the ECB will come in and blanket the Eurozone with printed currency, or the bankrupt countries will need to leave Europe (and the euro) and devalue their own currency. We will cover the PIIGS names you know in a moment, but before we do I want to introduce you to the newest member of the crisis club in Europe, France. While they have gone mostly unnoticed by the media thus far, their problems will begin to enter the spotlight in 2014. France had two successive months of economic contraction, which may translate into another quarterly decline in GDP. This would put the country back into technical recession. Unemployment in France has risen for 9 consecutive quarters and recently hit a new 16 year high. The rising euro in 2013 has been crushing for France. Their industry minister, Arnaud Montebourg, claims that every 10% rise in the euro costs France another 150,000 (remember our discussion on how the world would respond to Japan?). French debt to GDP rose to over 90 percent in 2013. Despite this troublesome outlook, the Illusion has taken hold for investors wanting more the French dream. The CAC 40, which is an index containing the largest 40 French companies, has been on a tear. Daily Sentiment Reading hit 97% bullish on December 30, even higher than the bullish reading just before the 2008 crash (93% bullish). The 10 year government bond in France sits at only 2.50%, lower than the risk free U.S. treasury bond of the same duration. Moving throughout the PIIGS we find a similar story. In Italy, the unemployment rate has crossed above 12% with youth unemployment at 41.6%. Poverty levels are at all time highs, while the debt to GDP crossed 127% in 2013. Meanwhile, the interest expense on Italian government debt has calmly declined. The 10 year yield has fallen to only 3.91%, less than 100 basis points of the 10 year US treasury yield. In Spain, unemployment has reached 26.7% with youth unemployment at 57.7 percent. 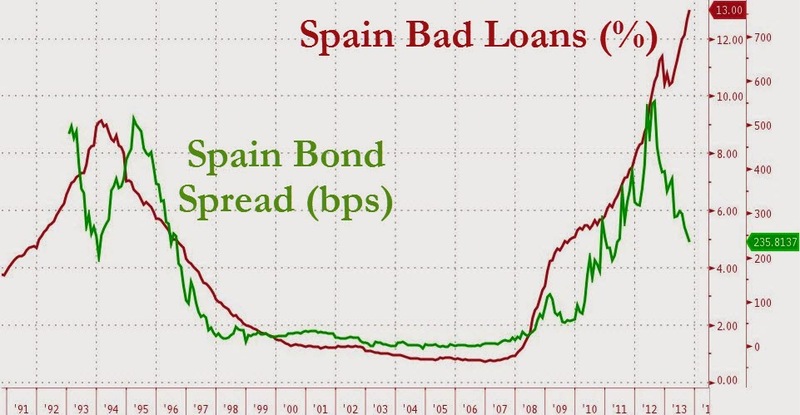 Spanish bad loans have hit 13% while the debt to GDP has risen to 86%. In spite of this, the same "magic" is occurring in Spain. 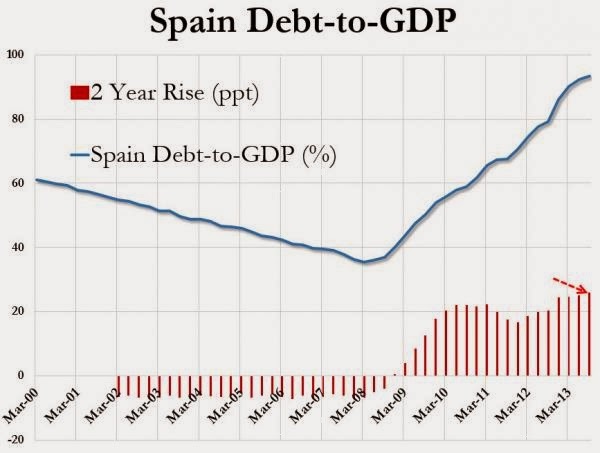 While Spanish bad loans soar, investors become more excited about purchasing toxic government debt as seen in the chart below. Investors used to worry about Spain's ability to pay its bills but that has long since subsided. The Illusion has become belief. 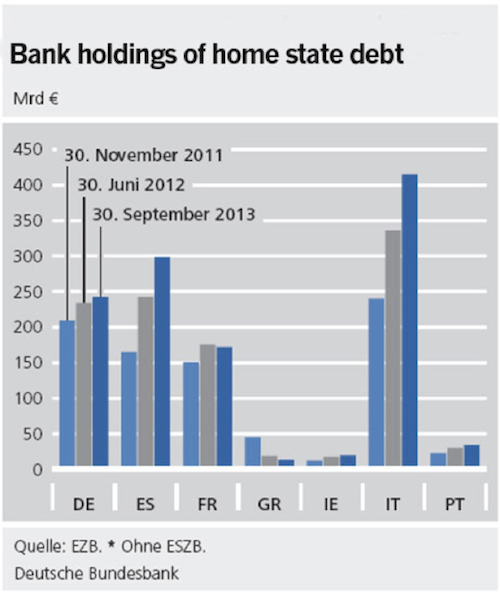 Bankrupt Spain is now treated almost as well as Germany by the financial markets. In Ireland economic growth is flat, unemployment is in double digits and their sovereign debt to GDP is exploding higher. These former worries for investors have been brushed aside. 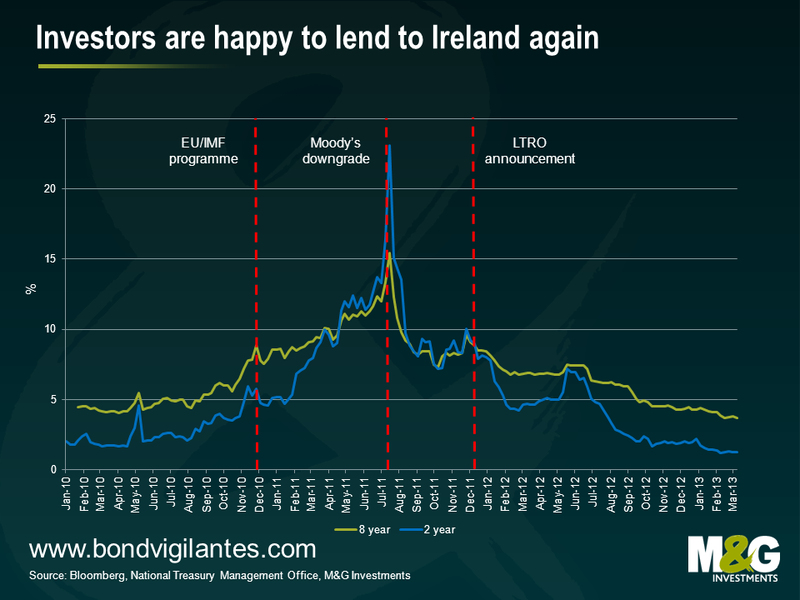 As seen in the collapsing yields below, Irish bond investors are now "Happy To Lend Again." No European story would be complete without Greece. 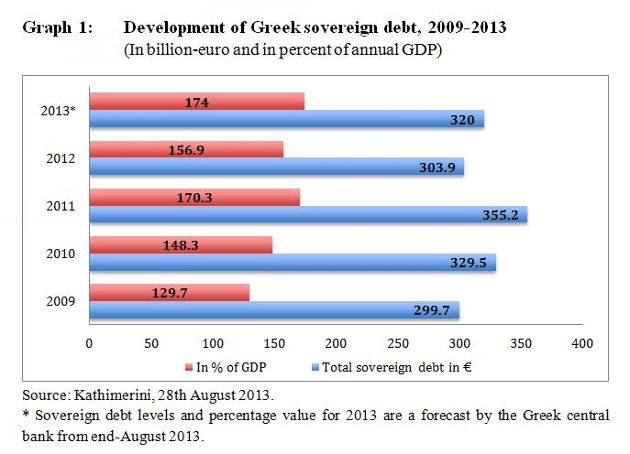 Greece now owes 320 billion euros in sovereign debt and its debt to GDP stands at 174% after two restructurings. The following shows the incredible rise from 1999 to 2013. With no hope of ever repaying this debt, the Greek 10 year yield has fallen to only 7.53%. The Greek stock market was one of the best performing assets on the planet in 2013 as liquidity drunk and momentum chasing investors piled in with force. Citigroup projects Greek debt to GDP to cross 200% by 2016 with unemployment at 32 percent. None of this matters in today's world. The Illusion has become belief. Which country within Europe may hit the headlines first in 2014? Remarkably, it may not be any of the above. The most likely bet is tiny Slovenia, which saw its GDP shrink by 2.7% in 2013. The GDP has declined by 11% since 2008 and their SBI stock index has collapsed 75% from the September 2007 peak. While the government recently injected 3 billion euros into their financial system, EU stress tests have found another 4.8 billion of potential losses. Based on the speed of Slovenia's decline, bailout talks may have already begun. Does this summary provide a rosy picture for the future of the European Union? Looking at the financial markets one could be confused. Yields on PIIGS government bonds have fallen to levels that are now close with the United States. Stock markets throughout Europe are exploding higher, and they have continued their relentless tear upward into early 2014. Sentiment has reached the euphoria stage on the expectation that asset prices will continue to move higher in the future. For those who thought this was just a United States Illusion, I hope you have seen how deep this rabbit hole goes. Investors around the world have moved full force into European risk assets on a central bank's "promise." How long can this wackiness go on? Something's gotta blow in 2014, right? If you put all the data out on a table it seems incredible it has not blown yet (I did not even cover the trouble in China - that will come in a bonus section). I would prepare yourself as if things will change tomorrow, but then go on living the rest of your life. Bubbles in the financial markets tend to last MUCH longer than people expect. A lesson learned from anyone trying to short stocks in 1996 or short housing in 2002.